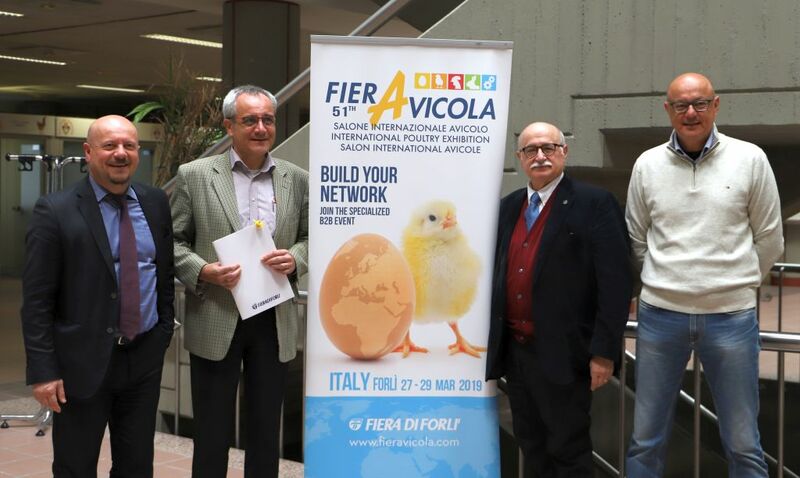 The 51st edition of Fieravicola opens its doors in Forlì today in the presence of Davide Drei, Mayor of Forlì, Alberto Zambianchi, Vice Chairman of the Romagna Chamber of Commerce and Stefano Gagliardi, Director of Assoavi. The exhibition for poultry farming professionals takes place from 27th to 29th March. "Since the beginning, back to the early fifties, the poultry industry has always surprised thanks to its dynamism and its growth rate. The main goal has always been the development of new technologies, that can support breeders. The Romagna region and Forlì have always been and still are crucial in the industry, both at the Italian and international level. Fieravicola is an important opportunity to discuss about the future and to present the new technologies to the visitors” explained Gianluca Bagnara, Chairman of Fiera Forlì. “Fieravicola represents the local system that has allowed our city to build international relations and to create a network of contacts which is important for the development of the local economy” said Davide Drei, Mayor of Forlì. “The National Commission for Eggs is located in Forlì, and that shows the importance the city has at the national level. This is surely a point that together with the encouraging 2018 economic data bodes well for the future” says Alberto Zambianchi, Vice Chairman of the Romagna Chamber of Commerce. The context has radically changed in recent years. On the one hand, the players on the market are constantly decreasing, but on the other they are always looking for innovation, efficiency and economies of scale. The Romagna region perfectly shows that and it has always been an incubator of ideas for the poultry of the future. Consumers do not know what needs to be done to produce a “egg” or a “chicken nugget”, but the poultry sector has reached an unprecedented high level as for food safety and it has become an example for many other production chains. Animal health and welfare of the farm and the economic dynamics of the market have always been important for Fieravicola, which is an exhibition professionals cannot miss. Fieravicola is far more than that and over the years it has developed a wide network with foreign partners in North Africa and Sub-Saharan Africa, but also in Russia and China. There will be 200 exhibitors, including 50 foreign companies, and buyers delegations from 16 countries. The “China animal agriculture association”, the main Chinese agricultural and farming association is an important partner for Fiera di Forlì and its vice executive secretary Yin Chengwen, is going to take part to the exhibition together with Li Jinghui, Chairman of the “China broiler alliance”, which is crucial in China for broiler production. Regione Emilia Romagna and ICE, the Italian agency that supports Italian companies abroad, worked together with Fieravicola to make this event even more international. The companies taking part to exhibition invest million of euros in research every year, to develop cutting edge technologies and to increase poultry sustainability. Today eggs and white meat are an excellent protein source for consumers worldwide at lower prices compared to other animal products due to the on-going innovation of the sector. A sector that worths 6 billion euros and has achieved a record in the agri-food balance, as it is self-sufficient for both white meat and eggs. That’s why taking part to Fieravicola is the best way to closely see the trends of one o the most dynamic Italian supply chains.